I have had the distinct pleasure of working with thousands of patients over my last 15 years of practice. There really is something quite amazing about being able to help another human being who needs it. However, on occasion, I have run into a situation where patients, albeit coming for help, seem to have already figured it out and think they know best. This has created a conflict for me as a practitioner. Based on good clinical acumen and, most times, supportive laboratory data, these patients’ ideas of what they needed to do, or keep doing were actually causing harm. Reminiscing on these particular cases, their ideas of how to care for themselves all seem to be tied to a trend. Something cited in the current media cycle, pregnant with promises of youth, energy, and more. I worked with a woman who insisted on “intermittent fasting” when I knew her HPA axis wasn’t handling the demand of glycolysis and caffeine in the morning. Intermittent fasting may be useful, but it was not her primary need at the time. Another who felt “ear candling” alone would take care of her immediate and complex needs and didn’t need to monitor other triggers such as nutrient deficiencies or dietary sensitivities. One patient had a white knuckled grip on consuming copious amounts of coconut oil, eating an “acai bowl” and cooking with a popular artificial sweetener to help manage her diabetes. In order to manage this conflict and truly do my job and help, I have done three things. 1. I make sure to establish myself as an expert, highlighting not only my credentials but my experience as well. I reference cases in the past and provide solid rationale in clear language of why my treatment recommendations don’t match their trends. 2. I ask them to tell me why they are here. “Why are you here?” This is an almost fool proof way to remind patients that they actually indeed did come in for help and they have chosen me to do that. It works like a charm, every time, and the air is cleared for therapeutic communication. 3. I provide evidence. Most of my recommendations can be backed by a clinical trial. If I don’t have one on hand, I will use a third-party online reference. This gives my suggestions added validity that reinforces my clinical comments. Honoring patients’ experience and choices is certainly a good standard of practice, but when current trends get in the way of good treatment, know that you have a responsibility to intervene and you have the tools to do your job. 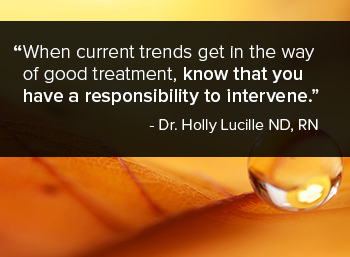 Dr. Holly Lucille, ND, RN, is a licensed naturopathic doctor, educator, natural products consultant, and television and radio host. She believes in the science, art, and mystery of healing and has a heartfelt passion for the individual wellness of all people. Built on this foundational belief, she uses the magnificence of multiple media platforms to truly make a difference and empower people to heal. Dr. Lucille’s private practice in Los Angeles, Healing from Within Healthcare, focuses on comprehensive naturopathic medicine and individualized care.